Many people cannot fully or safely access their gardens without help so our gardening services firstly improve safety and access in gardens in homes of approved clients. The services are primarily for function and safety rather than aesthetics but we also give horticultural advice. Work is discussed with clients before being done by a gardening team of volunteers led by qualified horticulturalists. 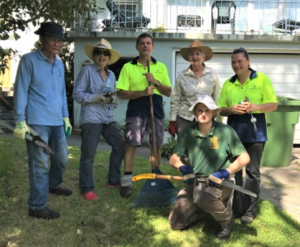 Our service is available to elderly or disabled residents in Hunters Hill, Willoughby, Lane Cove, Mosman and North Sydney council areas. With around 100 new client inquiries every year, demand for the service often exceeds capacity so clients are prioritised by need and ability to obtain alternative assistance. Our gardening service includes an assessment of your garden by a qualified horticulturist. They will discuss safety, access and maintenance issues relating to your garden and the work required to resolve them, then schedule an agreed time for the work. Most gardens have a scheduled visit every six months. Fees vary depending on eligibility criteria and are usually from $17 to $25 per hour.